Temperatures this week have been as good as Mediterranean countries; in fact better than Brazil's Rio de Janeiro! 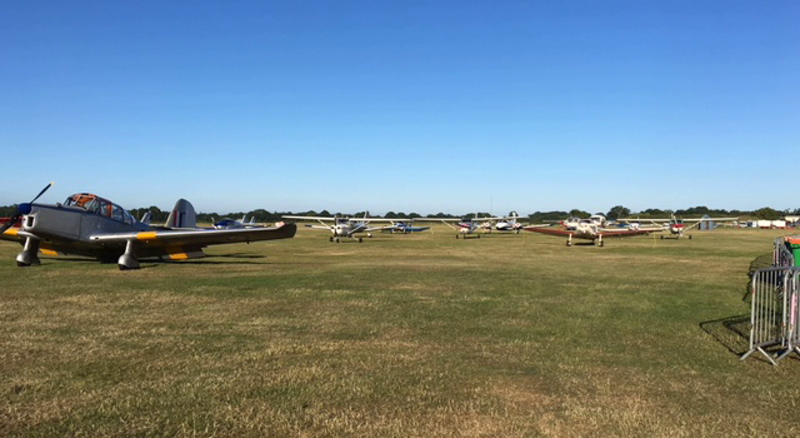 Another busy week for The English Apple Man with a visit to Marion Regan at Hugh Lowe Farms on Monday, followed by Rural Focus Press Group meeting at Hadlow College on Wednesday morning and The BIFGA THIRTIETH ANNUAL GENERAL MEETING held at Headcorn Aerodrome in the afternoon. On Monday, The English Apple Man spent a couple of hours with Marion Regan touring the strawberry and raspberry production areas central to her family business: Hugh Lowe farms. This year celebrates the 125th Anniversary of the business and The EAM will in future editions be covering the success of an enterprise which grew from a modest beginning in the late 1800's into one of the major producers of UK soft fruit and the supplier of strawberries to the Wimbledon Tennis Championships. A view from the top of the hill over Mereworth below, highlighting Hugh Lowe Farms soft fruit production areas. 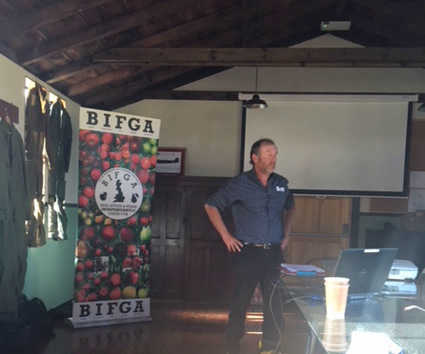 The BIFGA AGM chaired by John Breach, founder and chairman, dealt with the formalities and reviewed the BIFGA events held over the last 12 months. 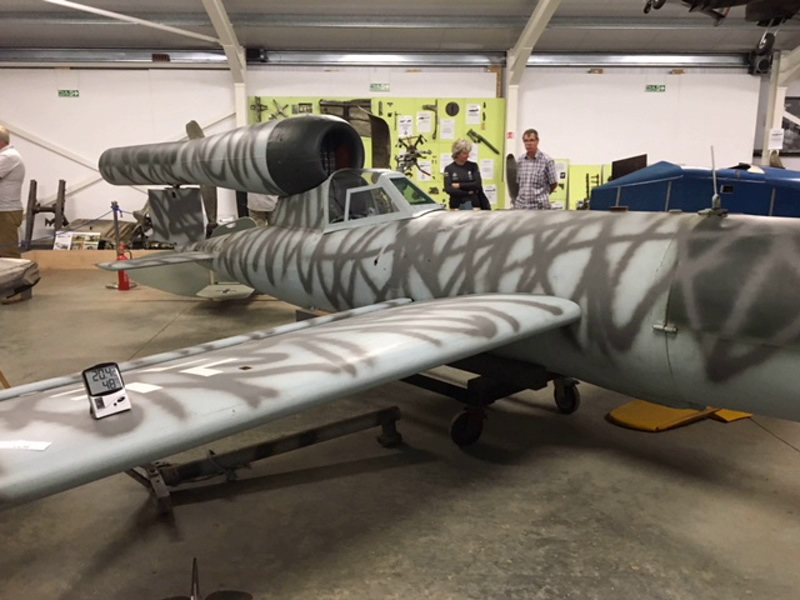 In conclusion John thanked his committee and a particular thanks to BIFGA Secretary Judi Perry who is responsible for the smooth running of BIFGA and all associated events. John also thanked BIFGA Sponsors - AGROVISTA. Before leaving the formalities, Vice Chairman Clive Edmed drew attention to John's amazing dedication to BIFGA and the many (unpaid) hours of work on behalf the BIFGA membership and it must be said 'the fruit industriy' as a whole. The formation of the Groceries Code Adjudicator came after many hours (years) of lobbying by John. 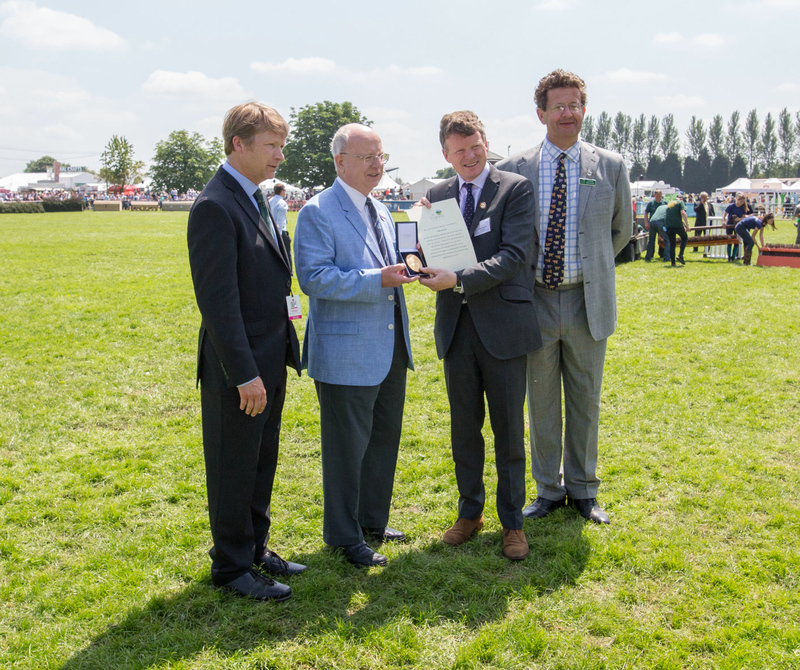 At this year's South of England Show held at Ardingly, John Breach was presented with the South of England Agricultural Society 2018 Award of Honour for his outstanding commitment to the top fruit industry, for having the vision for a collective voice for growers which led to the formation of British Independent Fruit Growers Association and championing the need for retailers to be subject to independent oversight culminating in the creation of The Grocery Code Adjudicator in 2013. 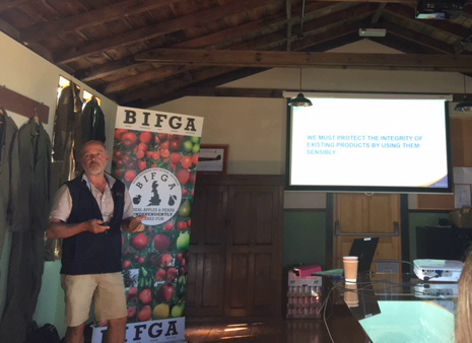 Following the AGM, a presentation by Paul Bennett, Technical Head of Fruit, Agrovista Product Management within Fungicide Spray Programs; from AGROVISTA highlighting the importance of protecting the integrity of crop protectant products by using them sensibly. Paul illustrated how the protectants important to the control of apple scab and mildew should be used, ensuring their efficacy and avoiding resistance, The genetically acquired ability of an organism to survive a pesticide application at doses that once killed most individuals of the same species. Paul set out a seasonal programme for scab & mildew control using different protectants and pointing out those with a risk of developing resistance and those which would not. Essentially, ensuring no more than 2 sequential applications of any one protectant. Ms Ali Capper of English Apples and Pears Ltd.
Ali Capper is a very, very busy lady. Ali farms with her husband Richard at STOCKS FARM in Herefordshire growing dessert apples, cider apples and hops. Ali is the Chairman of NFU Horticulture & Potatoes Board and active at NFU on growers behalf on many important issues; 'harvest workers' - 'crop protection' et al. 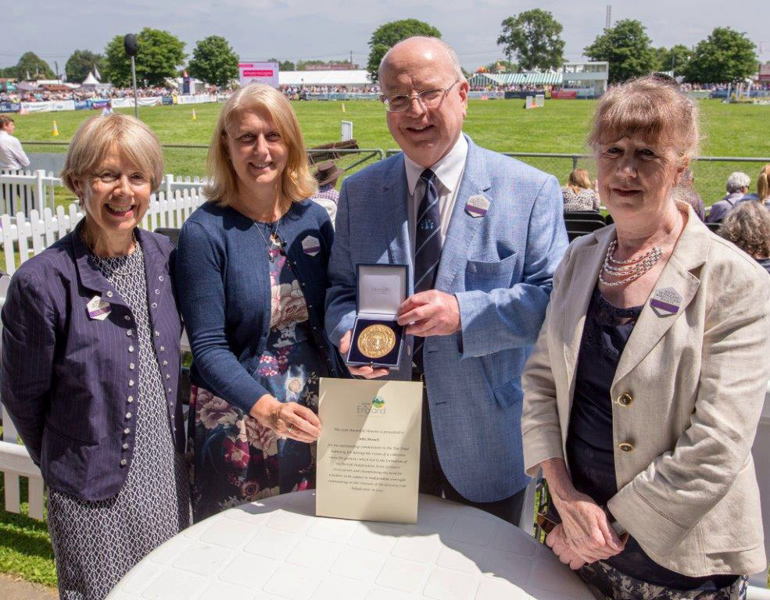 Recently Ali took on the role of English Apples & Pears 'Executive Chairman' working with Sarah Calcutt ( Chairman of The National Fruit Show) whose role as EAP Operations Director creates a 'streamlined' team reporting to a larger EAP Board of Directors. Ali updated BIFGA members on the 'equity' of crop protection materials. UK growers have access to less crop protectants - for example - Hop growers in the UK have access to 19 approved products; EU growers 35 and USA 66. Ali also discussed the drive to reintroduce a SAWS (Seasonal Agricultural Workers Scheme) to assist the recruitment of harvest workers in the UK. Ali demonstrated the importance of horticultural produce to the UK economy; a fact used to ensure our political leaders take note: 2% of the farm gate area produces 20% of the value to the economy; fruit is even more productive, with 0.6% delivering 15% value! As an industry we are so fortunate to have Ali and NFU President Minette Batters fighting for the future of UK growers. Their ability to understand the issues critical to our industry's future and the opportunity to convey the importance to the senior echelons of our political masters will shape the success of UK growers in the years ahead. Before wrapping up the formal BIFGA meeting, Nick Swatland led a discussion on the crop prospects for apples & pears this season. After the frosts in 2017 which caused sporadic damage across the country, this season shows 'knock on' effects. Where the crop was light in 2017 'generally' a good crop predicted this season, and where heavy crops were prevalent in 2017, crop predictions are not quite as good. However, the 'run off' (natural thinning caused by the tree adjusting to 'as yet' unknown influences) has been general. BIFGA growers pointed out some of the anomalies - Gala (naturally a good cropper) has been observed to have set 2-3 apples per bunch on the upper branches, while 1-2 on the lower branches. 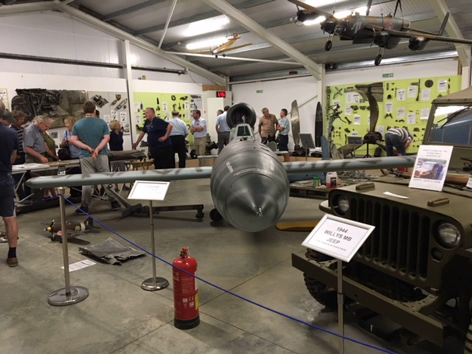 The general consensus appears to be: "we are probably looking at a good crop this year, but NOT a bumper crop"
After the formality of the BIFGA AGM and presentations, members had the opportunity to visit the Lashenden Air Warfare Museum. 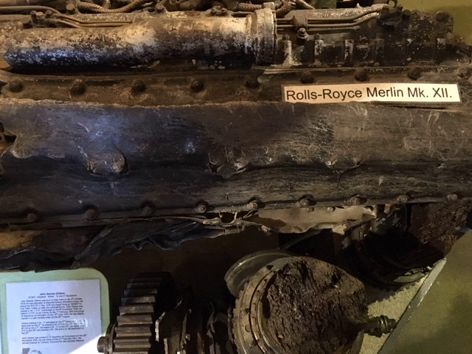 The museum is custodian for the RAF Ex Prisoner of War Association's collection of POW memorabilia & artefacts. 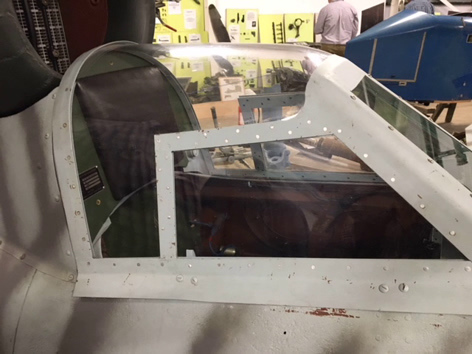 There are also exhibits from World War 1, the Vietnam War, Falklands War, and both Gulf Wars. They also have a large collection of British, German, and American uniforms. We finished our evening in beautiful sunshine enjoying a BBQ including local sausages, burgers, vegetable burgers, salad and cheese followed by fresh fruit salad or cheesecake; and cutting of BIFGA's 30th Anniversary Celebration Cake, a delicious fruit cake with plenty of tasty icing!